Sweet Floweret: 20 Minute Tuesday Number 5! 20 Minute Tuesday Number 5! Welcome to 20 Minute Tuesday! First off, I wanted to share that my friends over at Homespun With Love, featured silly old me on their blog last Friday! It was such a nice writeup of my blog, my products and myself. I hadn't been featured before and was honored when they asked. Thank you! 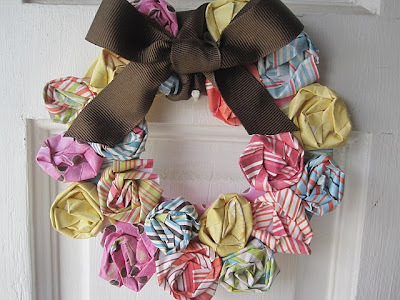 Without further ado, here are some of my favorite projects posted from the par-tay last week! 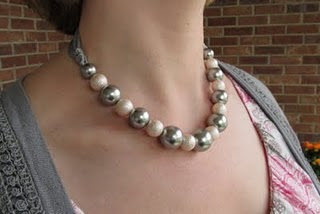 The first fave was this glam necklace posted by Jengerbread Creations. She even shows you how to make your own! I really need this next project on my wall. 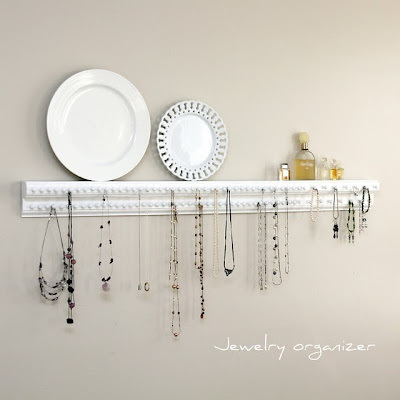 This necklace organizer made by LDH over at Grateful Prayer, Thankful Heart is fabulous! More room for necklaces means, more room for necklaces! Thanks for the invite! I am a new follower!! thanks for the invite and for hosting! love your blog-looking forward to following! happy tuesday! Beautiful pieces, wish I was this creative. Just visiting from vB.